In the early 1950s, as network TV grew in popularity, stories written for the small screen became more intricate and more important. To gain the recognition they felt they deserved, TV writers began to unionize. It took over a decade and even then, writers had to fight whenever their contract came up for renegotiation. NOTE: This article uses The New York Times as its primary source of information. As such, it may not reflect the intricacies of negotiations and strikes nor can it hope to be an exhaustive analysis of the issues facing TV writers. Rather, it is a survey of attempts by TV writers to form a union and fight for their share of new and emerging markets. Special attention must be drawn to the work of reporters Thomas M. Pryor and Murray Schumach on this topic. Dozens of their articles helped compile this history. 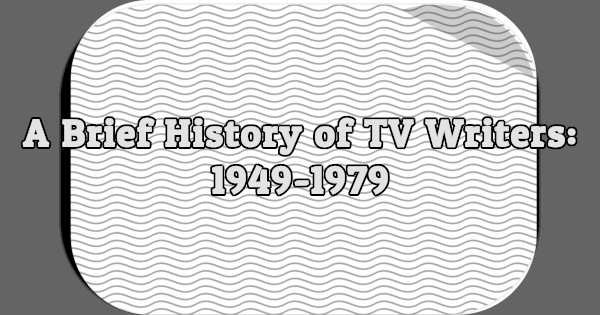 In January 1949, the Cooperative Writers Theatre for Television was formed . Nothing is known about the organization other than the name. That same month, the Screen Writers Guild joined with the Association of Film Writers in an attempt to gain jurisdiction over television writers. The Association of Film Writers, located on the east coast, became the eastern branch of the Screen Writers Guild . The Guild also began meeting with the Television Film Producers, made up of thirteen studios that produced roughly 85% of television product on the West Coast, for early discussions aimed at crafting a contract covering television writers . At the same time, the Television Writers Guild, a branch of the Authors League of America focusing on the television industry, was meeting to outline some of the issues facing the burgeoning television industry . Despite the increasing interest in television writing, by 1951 there was still no overall contract between writers and producers. The Screen Writers Guild and the Authors League met in July 1951 to discuss adopting a code that would, for starters, set minimum pay rates . Another concern for the Guild was the practice by some film producers of releasing films written for television in theaters without paying writers . The Guild confronted Hal Roach, Jr. in January 1952 for such an incident . The opposite was also known to happen: a film written for the theaters being shown on television without proper compensation. After the Screen Actors Guild reached an agreement with the Independent Motion Picture Producers Association to pay actors for films shown on television, the Screen Writers Guild announced it would seek the same sort of arrangement . In February 1952, the Screen Writers Guild voted to strike against the Alliance of Television Film Producers after a negotiation deadline to craft a “minimum basic agreement” passed without word from the Alliance . The strike date was set for March 10th. However, after negotiations were reopened the strike was called off . The negotiations were called off again in August and writers were notified by the Guild to avoid signing new deals with the Alliance of Television Film Producers that would interfere with a strike. Sticking points included royalty payments, ownership rights, and repayments for re-use . A strike to begin Monday, August 11th against the Alliance of Television Film Producers was announced on August 5th by the Screen Writers Guild. The Alliance contended that the Guild’s demands for royalty payments were outrageous but was prepared to continue negotiations if the Guild would alter its stance on royalties . With the support of the Authors League of America (of which the Guild was not a full member) and its branch groups, including the Radio Writers Guild and the Dramatists Guild, the Guild called a strike rally on Monday, August 11th. Various groups within the Guild pledged one percent of their salaries to go towards the strike for the duration . The day after the strike was called, however, writers were still at work for the producers, due to “deadline assignments” being allowed by the Guild. The Alliance reported that it was in a “favorable position” with regard to the strike, with both finished films and completed scripts . Writers rushing to complete “deadline assignments” were eventually ordered to halt all such work . On August 17th, the Radio Writers Guild denounced the strike as “illegal,” despite the fact that the Authors League of America, its parent organization, fully supported the strike. The Radio Writers Guild took issue with the strike being called before its membership could vote to authorize such a strike — and the Authors League of America constitution stated that no strike could be called before two-thirds of the members of any guild affected by the strike voted to authorize . By the end of August, the Radio Writers Guild revealed that 80% of its membership — more than the two-thirds needed — had voted to support the strike. Thus, nearly all television writers (70% represented by the Screen Writers Guild, 30% split between the Radio Writers Guild and non-union) were on strike. Additionally, a new organization called the Television Writers of America formed in Hollywood, hoping to gain representation for both live and film television writers . After intervention by the International Alliance of Theatrical Stage Employees and the Screen Actors Guild (led by Ronald Reagan), talks resumed in mid-September between the Guild, the Authors League of America, and the Alliance. Additionally, the Television Writers of America voted to support the strike while at the same time seeking to take on the role of bargaining agent for television writers from the Screen Writers Guild . By November, with the strike still underway, the Television Writers of America had petitioned the National Labor Relations Board to hold an election for bargaining representation of television writers. The Television Writers of America also accused members of the Screen Writers Guild and the Radio Writers Guild of “bootlegging” scripts to the Alliance. The Screen Writers Guild denied the accusation . The strike ended on November 16th after fourteen weeks, although a contract was not yet completed. In terms of royalty payments, rather than being based on a percentage of gross earnings by producers, the Guild and the Authors League agreed that royalties would be based on a percentage of a script’s original price. Writers would lease their scripts to producers for seven years, after which time the rights reverted back to the writers (although the producers could rebroadcast or remake the original television product). Additional points of the agreement covered payments for television product released theatrically and theatrical material shown on television . At its annual membership meeting on November 24th, the Screen Writers Guild voted not to ratify the contract because it was not yet complete. At the same time, however, the members gave the negotiation team a vote of confidence. Furthermore, the Guild increased its membership total to 1,278 . The contract was not fully written and agreed upon until March 1953 . In May, the National Labor Relations Board ordered television writers — those working for the networks on a free lance basis — to vote in a national bargaining election between the Television Writers of America and the Screen Writers Guild/Authors League of America . Also in May, the Screen Writers Guild announced that fifty-six independent television film producers agreed to abide by the terms of the contract forged by the Guild and the Alliance . The National Labor Relations Board mailed ballots to 425 writers in New York, Hollywood and Chicago in late May. In order to be eligible to vote, a writer must have sold at least one script to ABC, CBS or NBC between May 1st, 1952 and April 30th, 1953 [25; 26]. On June 12th, the Screen Writers Guild and the Authors League of America announced that the Television Writers of America had won the right to represent writers in live network television. By this time it had been revealed that the Television Writers of America had been formed by disgruntled members of the western branch of the Radio Writers Guild over the handling of the writers strike. The Authors League of America had threatened to expel the Radio Writers Guild if the group continued to boycott the strike. The Authors League and the Guild expressed disappointment at the “appearance of dual unionism” but would abide by the vote . Now representing network writers, the Television Writers of America began negotiating with ABC, CBS and NBC in October 1953 . In mid-December, the executive secretary of the Eastern Region of the Television Writers of America refused to answer questions about past involvement with the Communist party before a subcommittee of the House Un-American Activities Committee. This led the president of the Eastern Region (created in 1953) to resign in January 1954 and give up his membership, despite the fact that the Western Region announced that the secretary had taken an oath denying being a member of the Communist party. Ten other board members also resigned; all but one also gave up membership [29, 30, 31]. In May, the Screen Writers Guild voted to create “an all-embracing national union of writers working in motion pictures, television and radio,” to be called the American Writers Guild and split into West and East sections and affiliated with the Authors League of America . Plans for such a group began in late October 1953 when the Authors League of America and the Screen Writers Guild took tentative steps towards a merger . A month later, the Television Writers of America went on strike against ABC, CBS and NBC after negotiations fell apart. Picketing began on Wednesday, July 21st . The strike was called off on August 3rd due to lack of support by “many who sat on the sidelines,” according to the Western Region president . Meanwhile, the Screen Writers Guild and other groups continued working towards an independent national union — now called the Writers Guild of America. Voting began on August 26th . The Screen Writers Guild approved the Writers Guild of America constitution as well as an amendment banning Communists from membership in the Writers Guild of America, West. However, because the Screen Writers Guild would legally be part of the Writers Guild of America until elections were held on November 17th, the amendment was in limbo . The Television Writers of America dissolved in September, partly due to its failed strike against the networks and partly because of the formation of the Writers Guild of America . On November 18th, Richard Breen was elected president of the Writers Guild of America, West. Ivan Goff was elected president of the screen writers branch; Fenton Earnshaw of the television branch; and David Friedkin of the radio branch. The anti-Communist amendment was voted on, but results would not be counted until December 15th when the Writers Guild of America, East, also met to vote . On November 22nd, the National Labor Relations Board announced that the Writers Guild of America West and East won a vote to “act as collective bargaining agent for writers employed in live network television,” despite the fact that the Television Writers of America, the group that raised the jurisdictional dispute, had disbanded . The amendment to ban Communists later failed by three votes in January 1955 . 1 “Radio and Television.” New York Times. 13 Jan. 1949: 46. 2 Brady, Thomas F. “Warners Resume Work in February.” New York Times. 14 Jan. 1949: 29. 3 Brady, Thomas F. “Hollywood Digs Out.” 16 Jan. 1949: X5. 4 Gould, Jack. “Video Problem.” New York Times. Jul 3. 1949: X7. 5 “New Film Concern Started on Coast.” New York Times. 6 Jul. 1951: 15. 6 Pryor, Thomas M. “Writers Seek Pay for TV Film Deals.” New York Times. 19 Dec. 1951: 40. 7 Pryor, Thomas M. “Film Writers Call Roach Jr. On Pact.” New York Times. 10 Jan. 1952: 34. 8 Pryor, Thomas M. “Film Writers Seek Deal on Video, Too.” New York Times. 15 Feb. 1952: 17. 9 “TV Movie Makers Face New Strike.” New York Times 21 Feb. 1952: 36. 10 Pryor, Thomas M. “TV and Films Find New Note to Bind.” New York Times. 5 Mar. 1952: 32. 11 “TV Men, Movie Guild Break Off Pact Talk.” New York Times. 1 Aug. 1952: 8. 12 “Film Writers Set to Strike Monday.” New York Times. 6 Aug. 1952: 17. 13 Pryor, Thomas M. “Strike Scheduled By Screen Writers.” New York Times. 11 Aug. 1952: 22. 14 “Strike Start Fails to Halt TV Filming.” New York Times. 12 Aug. 1952: 26. 15 “Pryor, Thomas M. “U.S. Tax Held Doom to 6,000 Theatres.” New York Times. 15 Aug. 1952: 11. 16 “TV Strike Spurned By Radio Writers.” New York Times 18 Aug. 1952: 24. 17 Pryor, Thomas M. “Pros and Cons of TV Writer’s Rights.” New York Times. 31 Aug. 1952: X7. 18 Pryor, Thomas M. “New Talks Start in TV-Film Strike.” New York Times. 16 Seb. 1952: 33. 19 Pryor, Thomas M. “Jurisdictional TV Jigsaw Puzzle.” New York Times. 2 Nov. 1952: X15. 20 “Film Writers End Strike Against TV.” New York Times. 17 Nov. 1952: 21. 21 Pryor, Thomas M. “Screen Writers Defer Pact Vote.” New York Times. 26 Nov. 1952: 18. 22 “TV Film Writers In Pact.” New York Times. 6 Mar. 1953: 30. 23 “N.L.R.B. Sets Test For Video Unions.” New York Times. 4 May 1953: 26. 24 “TV Film Agreement.” New York Times. 21 May 1953: 38. 25 “TV Writers’ Union in Parley Tonight.” New York Times. 25 May 1953: 32. 26 “Television Notes.” New York Times. 26 May 1953: 40. 27 “TV Writers Group Wins N.L.R.B. Vote.” New York Times. 13 Jun. 1953: 10. 28 “Radio-TV Notes.” New York Times. 9 Oct. 1953: 24. 29 “Two Witnesses Silent.” New York Times. 17 Dec. 1953: 34. 30 “East Union Head Quits TV Writers.” New York Times. 14 Jan. 1954: 22. 31 “Union Musicians Ask 15% Pay Rise.” New York Times. 15 Jan. 1954: 27. 32 Pryor, Thomas M. “Screen Writers Back New Union.” New York Times. 21 May 1954: 18. 33 “Writers’ Groups Aim at Merger.”New York Times. 27 Oct. 1953: 31. 34 “TV Writers to Strike.” New York Times. 19 Jul. 1954: 14. 35 “Video Writers End 3-Network Strike.” New York Times. 4 Aug. 1954: 28. 36 Pryor, Thomas M. “Screen Writers Back New Union.” New York Times. 21 May 1954: 18. 37 Pryor, Thomas M. “Screen Writers Vote Ban on Reds.” New York Times. 27 Aug. 1954: 12. 38 “TV Union to Disband.” New York Times. 3 Sep. 1954: 24. 39 Pryor, Thomas M. “Scenarist Named By Writers Guild.” New York Times. 19 Nov. 1954: 20. 40 Pryor, Thomas M. “Leland Hayward to Produce Film.” New York Times. 23 Nov. 1954: 26. 41 Pryor, Thomas M. “Hollywood Election Count.” New York Times. 2 Jan. 1955: X5.